Earlier this year I started playing around with old jeans and scraps of denim. 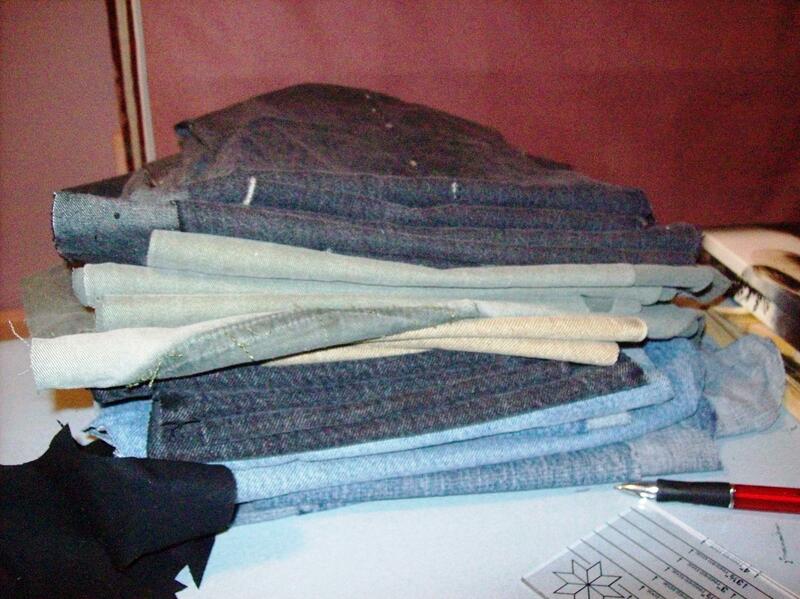 I didn’t really have any rhyme or reason, I was just toying around, not really knowing what I would make, what these old pieces of jeans would become… kind of like streams of consciousness crafting, lol. I wasn’t far into anything when I got called into doing some other major project and my little nowhere man got shoved into a forgotten corner of the fabric heap. Well, I have finally reunited myself with my little nowhere man, and have started working on him once more. Only now, I have all these ideas running through my head.. I’ve decided that my nowhere man needs a purpose.. he should be going somewhere. 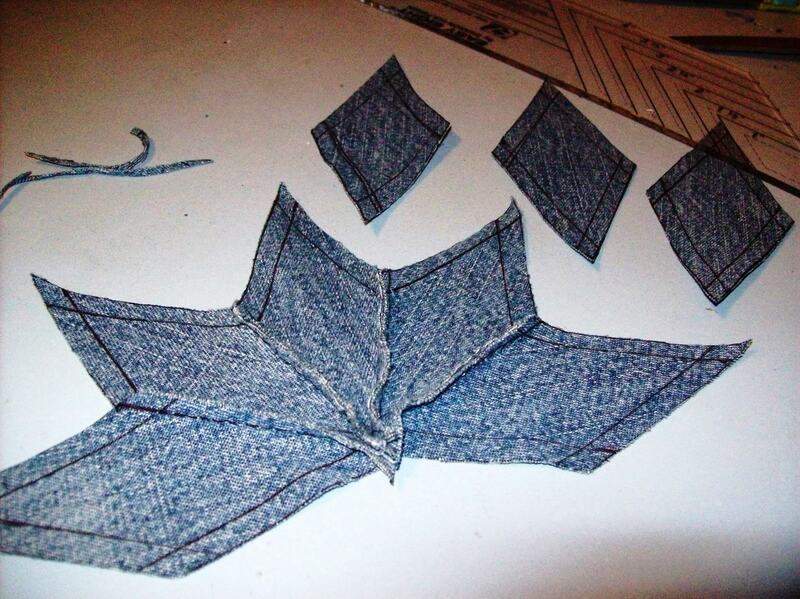 I considered what he is.. he is essentially pieces of recycled denim being handsewn together like a patchwork quilt. So I thought more about the concept of combining blue jeans and quilts… and thought to myself, a denim quilt, even a small one, would be kind of heavy and cumbersome. That was out. I thought about building on him and making him into a couch pillow.. but I felt that my nowhere man needed to be seen out in the world. He needs to be worn. But how? Despite the fact that denim has actually been around longer than the USA and was developed in Europe some 500 years ago blue jeans have become a distinctly American wardrobe. The word “jeans” comes from the name Genoa, where sailors wore pants made of a kind of rough cotton/ linen blend material(1). The officially recognized birthdate of the blue jeans we know and love today is May 20, 1873. It was on this day that Levi Strauss got the patent to add rivets for added durability. The idea of Jacob Davis, who sold the idea to Strauss and went into business with him (3). Blue jeans started off as the sturdy and long lasting pants worn by the miners, the scores of men searching for gold, and most any hard working laborer because they were rugged and didn’t rip and tear as easily. Because of this, jeans are tied into that American dream, that hunt for fortune and glory of the prospectors and into the notion of self-reliance and a hard days work. Before Hollywood started making westerns and depicting cowboys wearing jeans, cowboys actually hadn’t worn jeans as a regular thing. Of course, the movies and John Wayne helped to change that. It was in 1950’s that started to bring about the association of jeans with rebelliousness, non-conformity and youth. 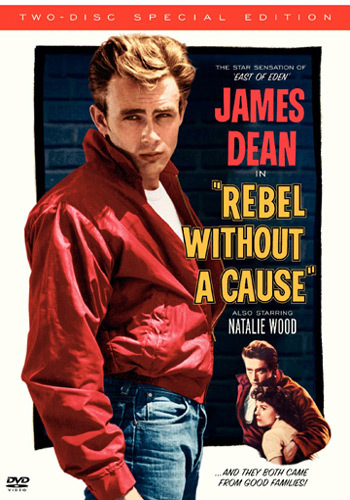 Teenagers were wearing jeans more often, and movies like “Rebel Without a Cause” with James Dean and “The Wild One” with Marlon Brando gave rise to the image of the American bad boy, the wild child anti-hero. And what was this iconic anti-hero wearing? Blue jeans (and a leather jacket, but that will be another post for another day). Did you know blue jeans were actually banned from schools and other public places because they were connected to this troublemaker image? Movie poster for "Rebel Without a Cause"
I thought about all these connotations, all these icons and images that are wrapped up into the very soul of the substance I was working with. I thought about the social and environmental implications of my making this.. thing.. strictly out of old blue jeans, and that I am not using my sewing machine at all and doing all the work by hand. My mind took a tangent off into the realm of Etsy and what kind of meaning that has for us, for those of us who have gotten tired of cookie cutter fashion and big corporations controlling what we buy, what we think. I thought of how 50-60 years ago, or more, Americans knew more about how to make their own clothes and alter them themselves. I thought about how few of those of us who sew our own clothes in America today know how to draft their own patterns.. we buy readily available patterns from McCall’s or Simplicity or whoever. All we have to do is trace and ta-da! I thought about that, and how girls in Japan draft their own patterns from ゴスロリ(Gosu Rori) and the like as if it were nothing. I feel like I’m in the middle of some kind of Pro-Green, Anti-Consumer Culture, Anti-Walmart-and-all-it-stands-for, Neo-Self-Reliance Revolution… and how, somehow, my little nowhere man is supposed to be this unifying visual symbol for all of these concepts and ideas. And then I remembered my Peirce (Semiotics) and what my nowhere man really began as.. a nowhere man. And I think he would look pretty cool as the back panel of a denim jacket when he grows up. So, a little about myself..
How do the clothes we wear communicate to others? Exploring cultural diffusion within the world of fashion. Exploring different textile traditions across the globe and through time. Both of these dresses were altered creations. The original dresses came from Goodwill. The first of these dresses started off as the matronly black dress pictured to the left. 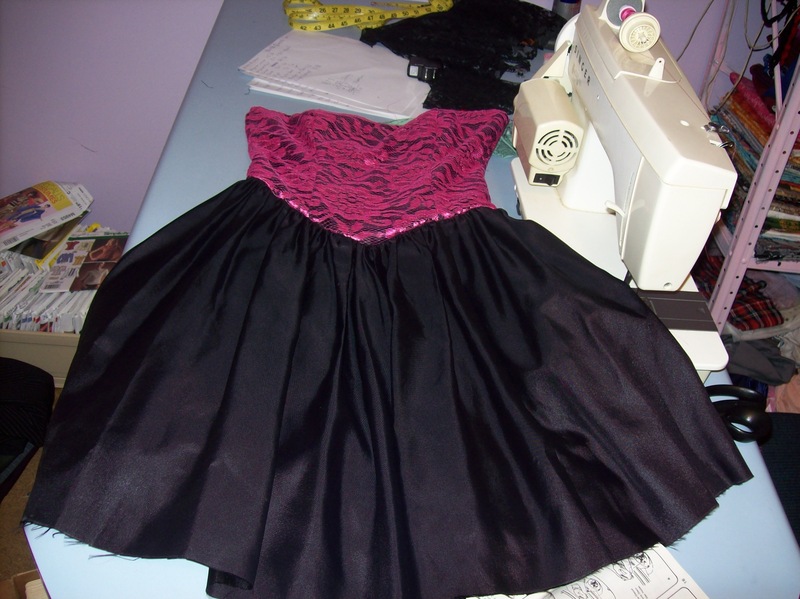 I took my seam ripper to it, removed the black lace and replaced it with hot pink lace, but without adding the neck or sleeves back to it , so it looks more like a corset style dress. I also shortened the skirt considerably (from floor length to just above the knees). The end result is pictured to the right. 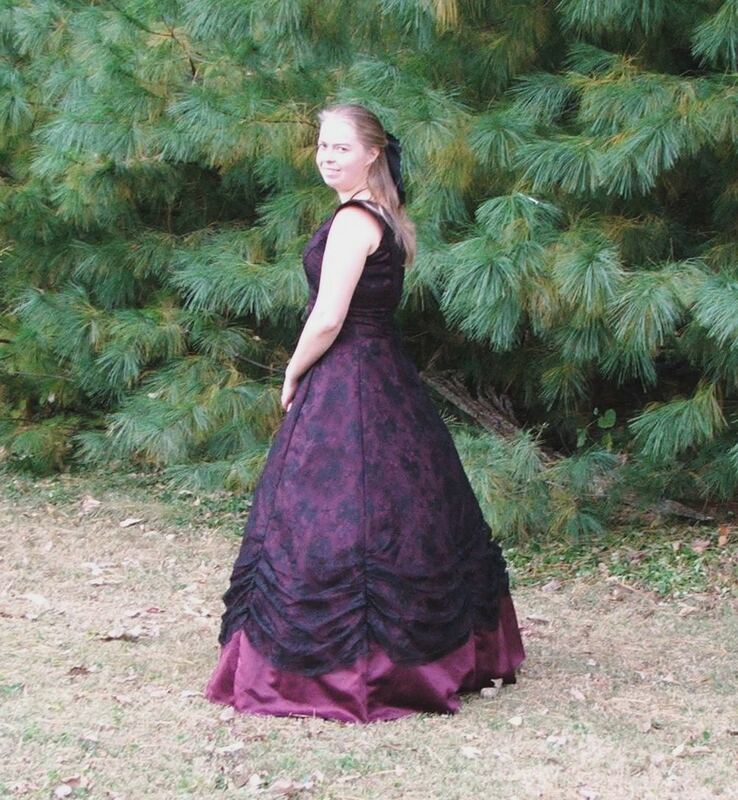 The second dress (which I unfortunately do not have a before picture of) started off as a maroon bridesmaids dress. The original was actually made by ILGWU. 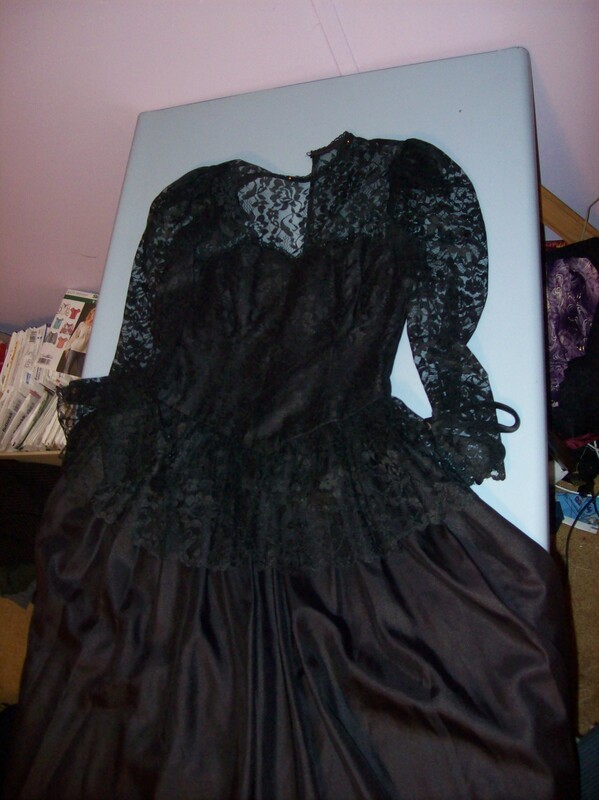 Basically, I removed the sleeves, took the dress completely apart (the seam ripper is my best friend), covered it in black lace, and sewed it back together, gathering the lace at the bottom in a kind of ball gown fashion. This might seem like a simple process, but trust me, I fought this dress like the devil. On more than one occasion I had to rip out my own stitches and redo it because the edges would not be lined up properly and one panel would seem longer than the other, or I’d have this unsightly fabric bubble (observe below). So what did I do? I screamed, cussed out both the dress and my sewing machine, cried a little bit and then proceeded to re-sew the seam by hand. This dress (and lack of sleep because I was trying to meet a deadline) almost drove me insane. 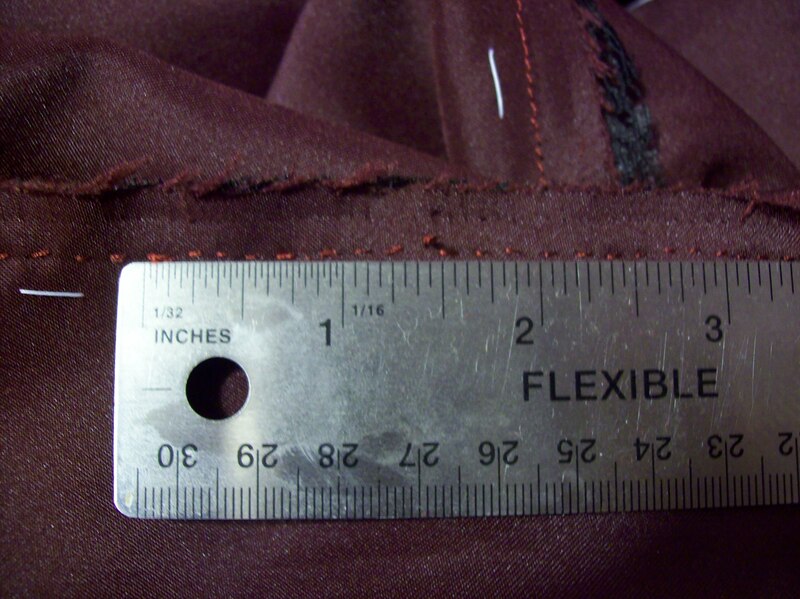 Pictured below is my hand stitching, with a ruler to show my distance between stitches. 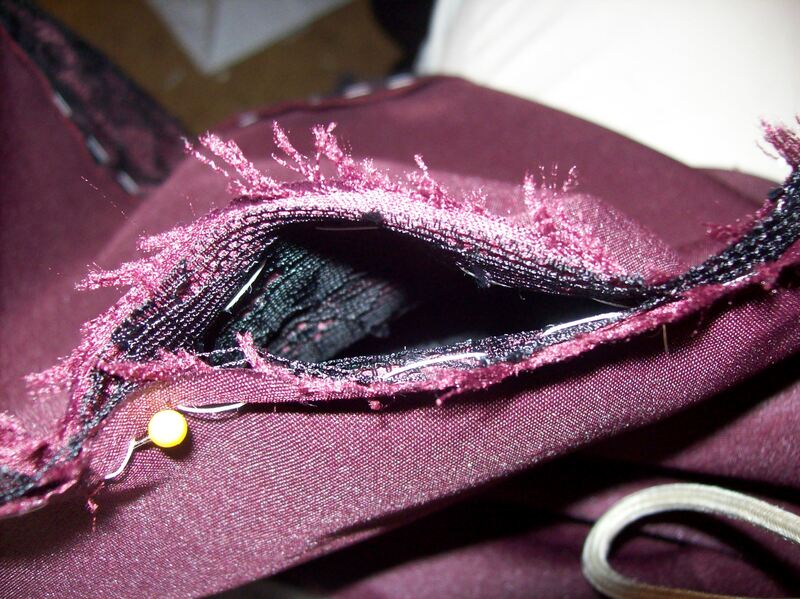 Anyone who sews by hand can appreciate this. And, finally, this is myself modeling the finished dress (with a hoop skirt underneath to give it volume).